Then this year during my fall workshop at the John C. Campbell Folk School in Brasstown, NC, I was treated to a vivid spring experience—in the heart October. The school’s beds and gardens were still overflowing with blooms and fresh produce. We dined week-long on a bounty of tomatoes and lettuces, in addition to more fall fare such as squash. A glance at the calendar revealed that, yes, it was still fall. But you know for certain where you are, by being honest with yourself about the moment you’re experiencing. And last week, in the gentle arms of NC’s blue ridge, I was blessed with one final week of warm, gentle summer. Lensbaby Velvet, extension tubes, Tamron 15-30mm extreme wide angle, some wide-to-telephoto, some shot for background bokeh, others for line and curve and the light show of capturing backlit abstracts. I threw whatever I’ve learned so far at last week, and the result was magic. Do I know everything there is about shooting beautiful art flower images? NO. Did I know enough to take advantage of the ideal opportunity presented to me? ABSOLUTELY. 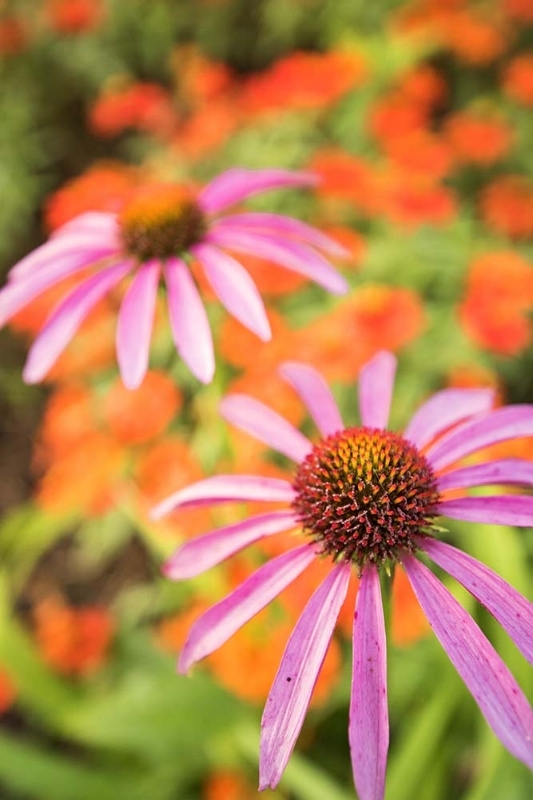 The lead image and the one below are close wide angle shots, with my camera lens jammed into the heart of these cone flowers—so I could use the wide-angle distortion to my advantage and also capture the fall-color bedding plants thriving just a bit down from the bed I was shooting in. The bright, backlit zinnia two images above and the one below were shot with my Lensbaby Velvet 85 and a 12 mm extension tube, taking advantage of the available light and vibrant blooms to create a macro and almost “xray” effect of seeing through petals and appreciating the detail our naked eye cannot capture. And on my first day there, before I even checked in at registration, the camellias called to me. They’d be “burned back” soon, I knew, once the night temps dropped (and they were by the end of the week, because we had a hard freeze after several mornings of heavy frost). Whatever I could do, I had to grab these beauties. So off I went with my tripod, my Lensbaby, my Nikon 105mm and Tamron 180mm macro lenses, and whatever else I needed. Oh, yeah. There were extension tubes, too, which thankfully I have experience knowing how to use when I can get super close and at just the right angle. Sound a bit advanced? Maybe. Only in so far as your familiarity with how to use your equipment and knowing when it’s most effective. But just look at the results you can achieve when your own personal level of expertise and experience mashes up against the marvel of being in the right place at the right time!